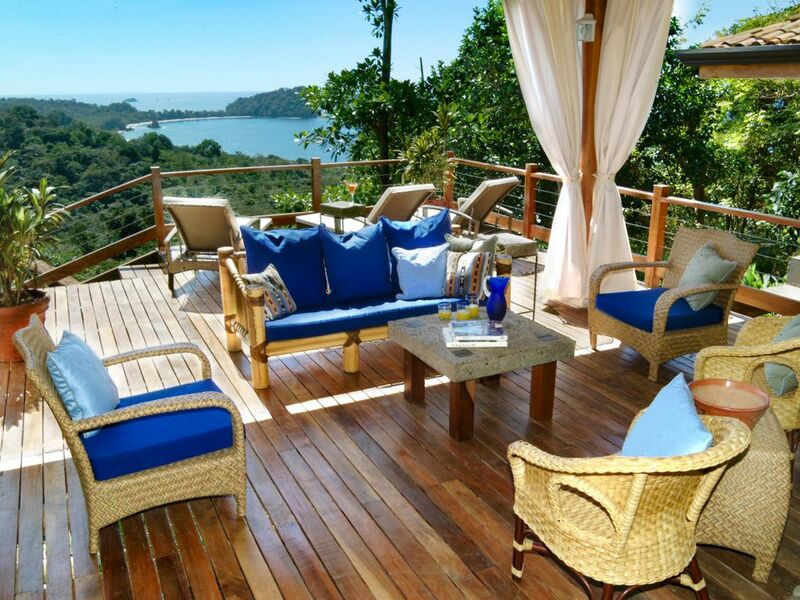 Casa Samba is the perfect tropical escape villa. This 5-bedrooms, 6-bathrooms villa was built into a bluff, overlooking the rainforest with vast Pacific Ocean views near Playa Espadilla white sand beach. It is in the exclusive cobble stoned neighborhood on Pacific Canyon Drive, private, but easily accessible to the local markets, restaurants, spas and the Manual Antonio National Park. The villa’s multi-level living spaces all open to ocean breezes and tropical gardens with exotic sounds and scents from the local flora and fauna. This is not the typical vacation villa that was hastily built to get a quick flip. The owner actually lived in Casa Samba with his family, sparing no details to make this an original and exquisitely designed Balinese style home. Includes cathedral bamboo open beam ceilings, hand-carved stone and glazed earthenware custom sinks, custom stonework and tile, exotic hardwoods and original art from around the world. Off street for 2 cars. There are tennis courts in the area. World Class Sport Fishing, Pristine Beaches, White Water Rafting, Canopy Tours, Mangrove Tours, National Parks, Four Wheel Adventures, Wildlife Viewing (see monkeys, sloths and toucans from your living room!) Horseback Riding, Waterfall Tours, Restaurants and Fine Dining, Cinema, Dancing, Full Tour Menu with CD presentation provided upon check in.